Posted by HugOfJoy.com at 1:14 p.m. Hug Of Joy™ began simply from the way I parented my baby daughter Hailey. From what I struggled with that was lacking in baby carriers I came to realize that there was no baby carrier on the market that was easy and comfortable for a mom, and was elegant, sleek, modern and cutting edge enough for the most discerning moms. 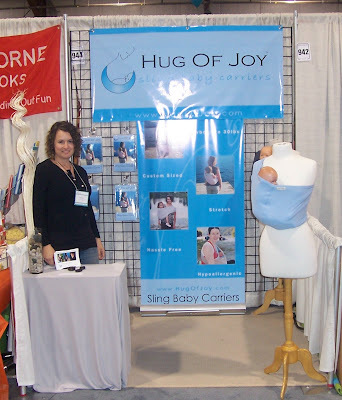 I designed and launched Hug Of Joy™ in the fall of 2006 as my Mat leave ended. It quickly became clear that Hug Of Joy™ was going to be much busier than I ever had imagined. Hug Of Joy baby carriers has developed into a highly versatile baby carrier that has improved upon other carriers on the market, making it a radically different baby carrier and a radically different experience for parents who have been compromising on what they can expect from one carrier. Hug Of Joy™ has received an overwhelming positive response. This has been the most rewarding experience as the creator of the product and a business owner, to have such overwhelming support and demand for this baby carrier. Hug Of Joy™ is still hand made in Canada, employing experienced women from the community to work from their homes and we love this! kiddopotamus -if you bought nothing else! Beach nut Teething Cookies - imagine, the second ingredient isn't Sugar!